The Turkish economy performed reasonably well in the first half of 2014 despite the turmoil in the wake of the FED announcing a tapering of its monetary policy. Given both the continuing acceleration in internal demand sparked by the ‘dovish’ policy stance adopted by the Central Bank to the political pressure and expansionary fiscal policy caused by the elections and the rebalancing of external demand following the depreciation of the Turkish lira, the economy is expected to grow by 3.7% in 2014. Further credit growth will be difficult to forge. 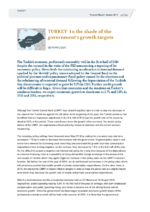 Given that constraint and the tensions on Turkey’s southern borders, we expect economic growth to decelerate to 2.7% and 2.8% in 2015 and 2016, respectively.